Client-ghostwriter collaboration is like courtship. It always starts off with uncertainty, then subsides when you slide into that rhythm of collaboration. 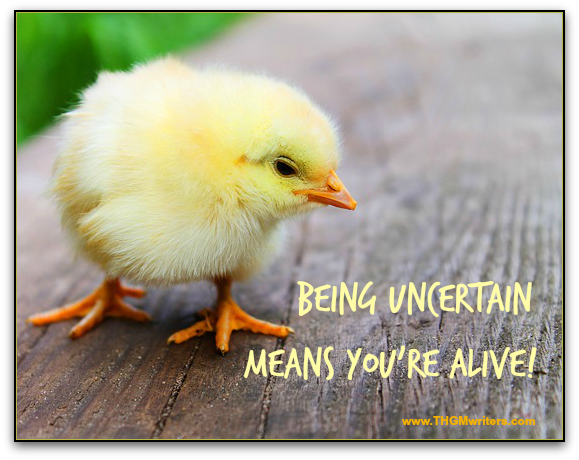 “Being Uncertain Means You’re Alive”. Because my fingers are super-glued to Google, I googled “uncertainty in a writing career” because I felt a blog post cooking. Surprise: I found a blog post from Just Write Dammit addressing this topic. More on that in just a moment. I know…there’s nothing like a dash of suspense to liven up a post about uncertainty–which, coincidentally, is often part of a writer’s job description, especially if you write fiction. Politically the world is in a state of uncertainty, and if you are a writer, a ghostwriter or a client seeking to tell your story, you have just entered into The Uncertain Zone, despite possibly having read books such as Embracing Uncertainty. I am not talking about believing in your story when would-be well-meaning (and otherwise) critics advise you against your dream. I’m talking about the inevitable uncertainty that writers feel and that sometimes sneaks into a ghostwriting relationship. On and on and on. The writers may not express any of these things to the clients, because we never let ’em see us sweat. The client, however, might express her fears and desires to the writer. Here’s a little secret: Everything both of you are thinking is completely normal. It does not mean that the project is doomed or you should take your anxieties or concerns as ill omens. From personal experience, I know that doubts on the client’s side and the writer’s side subside when you get into that rhythm of collaboration. It’s a courtship–you are both concerned with what you have to offer the other person, what they think of you, and whether there will be a happily ever after–whatever that means for you. I spent most of my idle thoughts on where the hell I was going to be in the next six months. Have you ever given a thought to what this quote really means? To me it means that we should fear being fearful because it is the fear of uncertainty that will paralyze us to inaction or irrational action. – What is the worst case scenario if this actually happens? – What is this fear holding you back from? – What are the choices that would lead to the fear coming true? – What choices can you make TODAY to start your plan to make sure it doesn’t come true? – How are you going to feel when you conquer this fear? Do me a favor. Today I want you to set aside 30 minutes or so and answer these 5 questions as deep as you can. Both ghostwriter and client can do this exercise. It may be the most important preparation you’ll make as you embark on this adventure. Writing a book is a journey. While the inevitable goal is to get the ring, there’s something freeing about allowing yourselves to get to know the project on a deeper level. And let it surprise you–pleasantly. The good part of embracing uncertainty is that you won’t be bored. And neither will your intended audience. Kristin Johnson is a longstanding writer for many clients of THGM Writing Services. My eldest, Chantalyne, spent much of Grade 5 and Grade 6 sweating over where to move on to the arts high school for Grade 7 and leave her friends behind, or to stick with her friends through Grade 8, and then switch to the arts high school in Grade 9. As soon as she made the decision to move on for Grade 7, she was able to actually enjoy the rest of Grade 6 with her friends. A major decision for certain at that age–and at any age, to leave the familiar and try something new. However, Chantalyne sounds wise beyond her years. Maybe her peers can take a lesson from her?? Oh, and she must have great parents. Interesting that a month after this blog post, the Telegraph and Mr. Greenblatt should make such a major point on theme of uncertainty and art, and transforming uncertainty.